That big Hangouts update wasn't just about making it prettier and finally rolling in Google Voice. 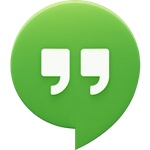 Google also continued its efforts to make Hangouts independent of Google+, as it previously announced. You can now make multi-way video calls without a Google+ profile on Android. As of the most recent update, users without a Google+ profile will be able to do the following via the app. The last movement on this front was back in June when Google changed the behavior of user profile pics in Hangouts. They used to open the Google+ profile, but now they pull up a contact card. The new version gives those who don't want anything to do with Google+ a reason to take another look at Hangouts. It's not a perfect solution (just watch the AP podcast live and you'll see), but it's still probably the easiest way to get a group video chat going.